Dec 13, 2017 -- Reflecting on 2017! Added thanks to all the sound crews that keep us sounding good at the gigs. Couldn’t do it without y’all! Nov 28, 2016 -- Big Announcement! 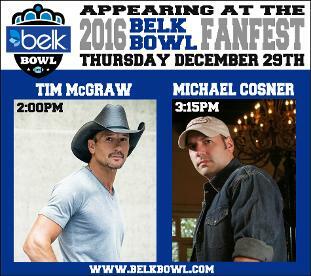 Michael will be performing at the 2016 Belk Bowl Fanfest on Dec. 29th. Show will be headlined by Tim McGraw! Oct 18, 2016 -- Big Announcement! The legendary Mickey Gilley has released "Kickin' It Down The Road!" The title track was written by Michael, Byron Hill and Mike Kenny. Call 1-800-445-5391 to purchase a copy! June 29, 2016 -- New Show Announced! Michael will be part of this year's Matthews Alive Festival in Matthews, NC on Sept. 4th. He will be opening for this year's headliner, Joe Diffie! The festival is FREE to the public! June 29, 2016 -- New Show Announced! Michael will be part of this year's Clayton Shindig in Clayton, NC on Oct. 8th. The Clayton Shindig features 10 bands on 2 stages. This year's headliner is American Aquarium! Apr 28, 2016 -- New Show Announced! Michael will be part of Crash Craddock's Country Jam on Sat. July 16th at The High Point Theater in High Point, NC. The show will also feature The Malpass Brothersand, of course, Billy "Crash" Craddock. For more information, contact The High Point Theatre at 336-887-3001. Mar 24, 2016 -- New Show Announced! Michael will be the featured performer at The Ice House Theater on Fri. May 29th in Selma, NC. Doors open at 7:00pm. Michael and the band will begin at 7:45pm. For more information, contact The Ice House Theater at 919-631-3797. March 24, 2016 -- New shows announced! Monday July 4, 2016, Michael will be headlining this year's Southeast Old Threshers' Reunion at the Denton Farmpark in Denton, NC. Shows will be at 3:00pm and 8:00pm. Dec 15, 2015 -- New Show Announced! Michael will be the featured performer at The Ice House Theater on Fri. Feb. 26th in Selma, NC. Doors open at 7:00pm. Michael and the band will begin at 7:45pm. For more information, contact The Ice House Theater at 919-631-3797. Oct 1, 2015 -- New Show Announced! Michael will be the featured performer at The Ice House Theater on Fri. Nov. 6th in Selma, NC. Doors open at 7:00pm. Michael and the band will begin at 7:45pm. For more information, contact The Ice House Theater at 919-631-3797. Sept 28, 2015 -- New Show Announced! Michael will be performing at The Don Gibson Theater on Sat. Oct. 10th in Shelby, NC. The show will be headlined by The Timejumpers featuring Vince Gill! 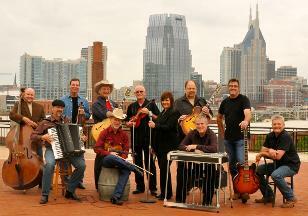 Michael and the band will begin at 6:30pm, followed by The Timejumpers at 8:00pm. Aug 7, 2015 -- New Show Announced! Michael will be performing at the 2015 Brightleaf Hoedown on Sat. Sept. 19th in Yanceyville, NC. Show begins at 2:30 in the historic town square! July 25, 2015 -- New Show Announced! Michael will be performing at The Don Gibson Theater on Sat. Aug. 29th in Shelby, NC. 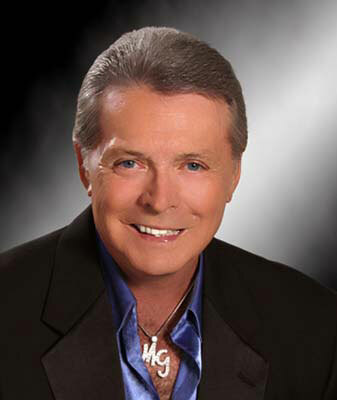 The show will be headlined by the great Mickey Gilley! Michael will begin at 6:30pm, followed by Mickey Gilley at 8:00pm. Tickets are available here! June 10, 2015 -- New Show Announced! Michael will be opening for Blackhawk at the Matthews Alive Festival on Sunday Sept. 6th. Michael will take the stage at 5:30pm followed by Blackhawk. 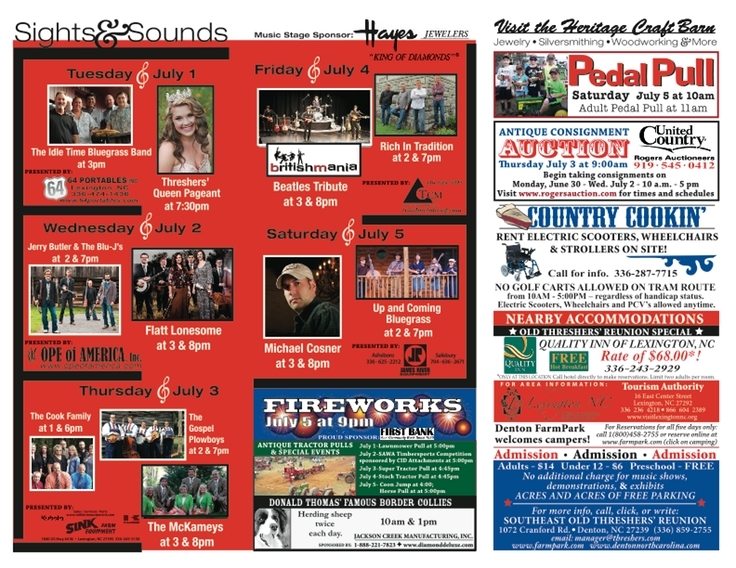 If you're in or around Charlotte, NC on Labor Day weekend, drive over to Matthews, NC for the festival. It's free to the public! May 19, 2015 -- "Carry On," a song penned by Michael, Byron Hill and Mike Kenny, has been recorded by Ottar "Big Hand" Johansen (Norway/Scandinavia) and will be on his upcoming album "50 Years On The Road." Release date is set for May 29, 2015. Thanks Big Hand! February 25, 2015 -- Michael will be featured in 2 episodes of "The Right Place With Kevin Sport," which airs nationally on RFD-TV, on Saturday, March 14 and Saturday March 21. Tune in! November 12, 2014 -- New show announced! Saturday February 14, 2015, Michael will be opening for Mandy Barnett at The High Point Theatre in High Point, NC. Purchase tickets here. September 22, 2014 -- Michael will be in Columbia, TN on October 11, 2014 for a TV taping of "The Right Place With Kevin Sport" which airs on RFD Network. Show starts at 8:00 at Puckett's Grocery. September 15, 2014 -- New show added! Saturday November 15, 2014 at The Don Gibson Theater in Shelby, NC. Show will be headlined by the great Marty Stuart! September 4, 2014 -- New show announced! October 16, 2014 Michael will be performing at Centennial Station in High Point, NC. Acoustic performance starts at 7:00! August 27, 2014 -- New show announced! 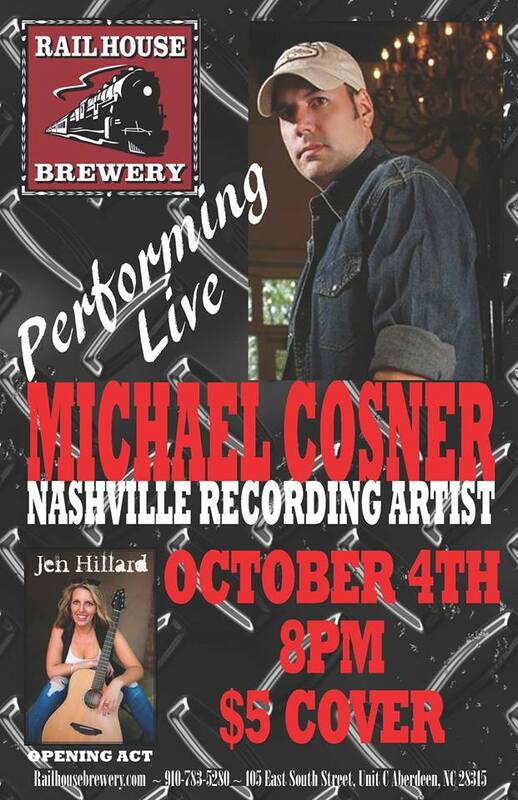 October 4, 2014 Michael will be performing at The Railhouse in Aberdeen, NC. Full band show starts at 9:00! July 22, 2014 -- Michael is now in rotation on PANDORA Internet Radio! Set up your "Stay Country" channel now! June 30, 2014 -- Listen for Michael's interview on WKXR 1260AM with Larry Reid on Thursday July 3rd at 9:30! June 10, 2014 -- Look for Michael, along with Producer, Byron Hill, on Greensboro, NC's CBS Affiliate, WFMY on June 16! They will be performing and talking about their upcoming show at The Hanesbrands Theater on "The Good Morning Show" during the 7:55 segment. May 19, 2014 -- Michael has been nominated for Best Male Country Performer at the 2014 Carolina Music Awards. Please go vote for Michael here! May 5, 2014 -- Michael is now in rotation on "Today's Country with Tim Kelly" part of Music Road Radio. Go check out Tim's show! May 1, 2014 -- New show announced! On Wednesday June 18, 2014, Michael will be performing with 5 other songwriters at The Hanesbrands Theatre in Winston-Salem, NC as a part of "Songwriters On The Road." Show starts at 7:30pm. Other performers include hit songwriters Byron Hill, John Ford Coley and Roxie Dean. Call 336-747-1414 for tickets or order online here. March 26, 2014 -- New show announced! Saturday May 3, 2014, Michael will be opening for CMA, ACM, IBMA & Grammy winner Marty Raybon at The Don Gibson Theater in Shelby, NC. Show starts at 8:00pm. Purchase tickets here. March 24, 2014 -- New shows announced! 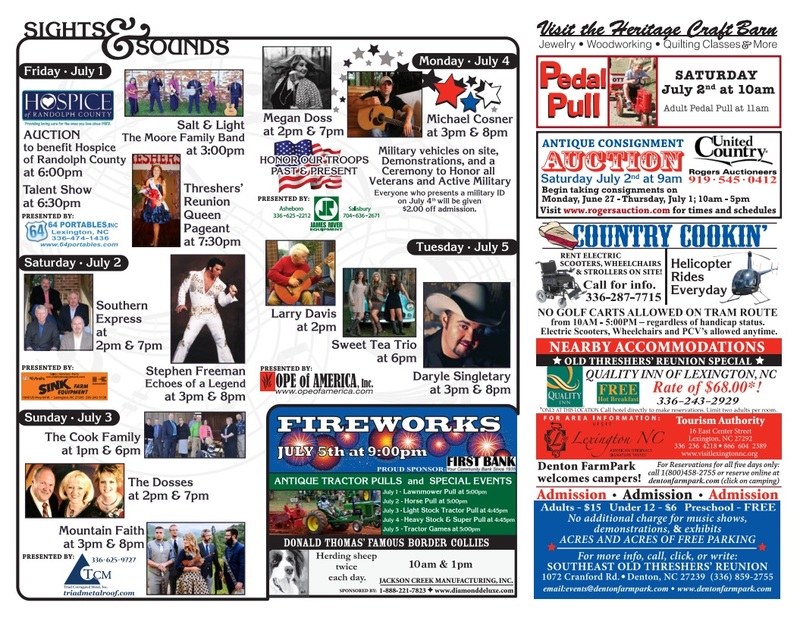 Saturday July 5, 2014, Michael will be headlining this year's Southeast Old Threshers' Reunion at the Denton Farmpark in Denton, NC. Shows will be at 3:00pm and 8:00pm. Stay tuned for more details! February 18, 2014 -- Join Michael on "The Carolina Show" on WQFS Wednesday February 19, 2014 at 12:30pm. He'll be in-studio with Chris Roulhac playing live and talking about his upcoming show with Jim Lauderdale! February 12, 2014 -- Read the new album review of STAY COUNTRY by Paul Oxley at New Country UK! January 29, 2014 -- Check out the short video from filmmaker Jack Pennington featuring Michael and the band. January 28, 2014 -- New show announced! 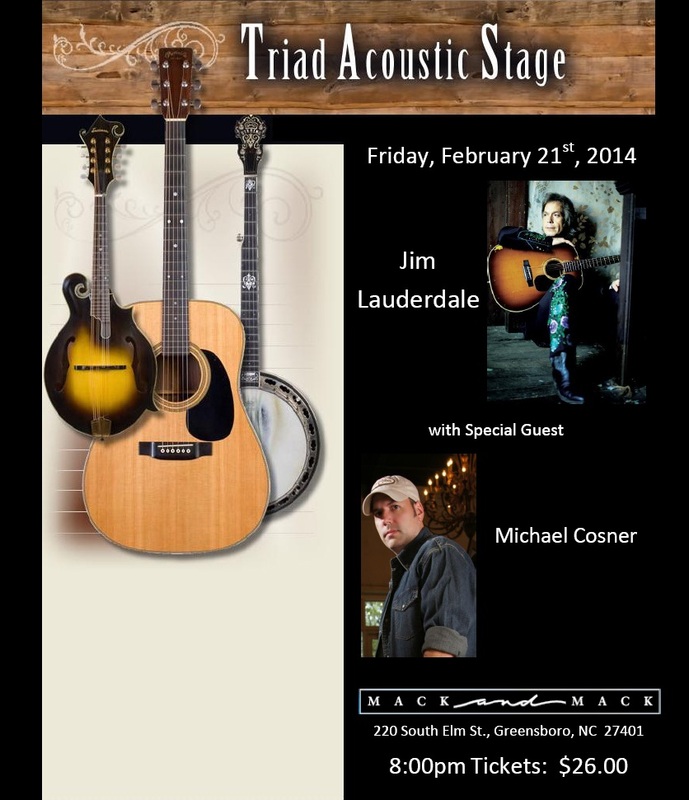 Friday February 21, 2014 for Triad Acoustic Stage in Greensboro, NC. Opening for Jim Lauderdale! Click on my Shows page for more details. January 14, 2014 -- KICKIN' IT DOWN THE ROAD will be in rotation on Honky-Tonk Junkie Radio starting 1-16-14. Go check them out! November 2, 2013 -- Michael has been selected to perform at the 2014 Triad Music Festival in Winston-Salem, NC in January. Stay tuned for updates! August 26, 2013 -- Michael will be performing at this year's Art of Sound Music Festival in Shelby, NC. The performance will take place on Saturday, September 21st at 6:00 on the main stage at The Don Gibson Theater. June 12, 20013 -- Read the new article by Ogi Overman in The Jamestown News. "Rising Country Star Appears at The Deck Friday"
April 20, 2013 -- The STAY COUNTRY CD is now available in the Online Store and at Amazon. April 11, 2013 -- New show announced! Sunday May 26, 2013 at Crouse Park in Sparta, NC, opening for Marty Raybon! March 10, 2013 -- New review of STAY COUNTRY is up at "That's Music To Me." "Michael Cosner Reminds Everyone To STAY COUNTRY"
March 6, 2013 -- Michael is on the cover of this week's Go Triad Magazine and the subject of the feature article by Jeri Rowe, Entertainment writer for the Greensboro News & Record. 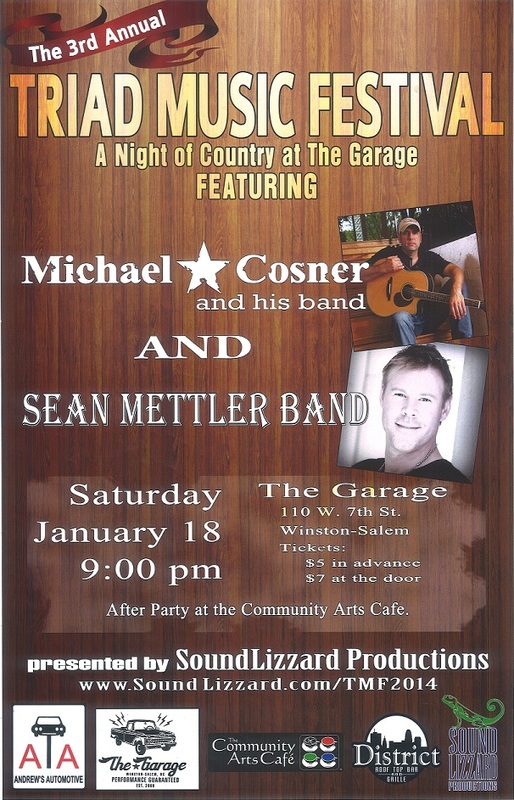 "Local Country Singer Michael Cosner is Back on Track"
February 25, 2013 -- Read the new review of STAY COUNTRY at Country Music Tattle Tale. "Michael Cosner Knows How To 'STAY COUNTRY' "
February 20, 2013 -- Michael is now in rotation at Josie's Country Blast Radio. January 16, 2013 -- Watch Michael's performance on January 22nd live on USTREAM at 10:00pm EST. 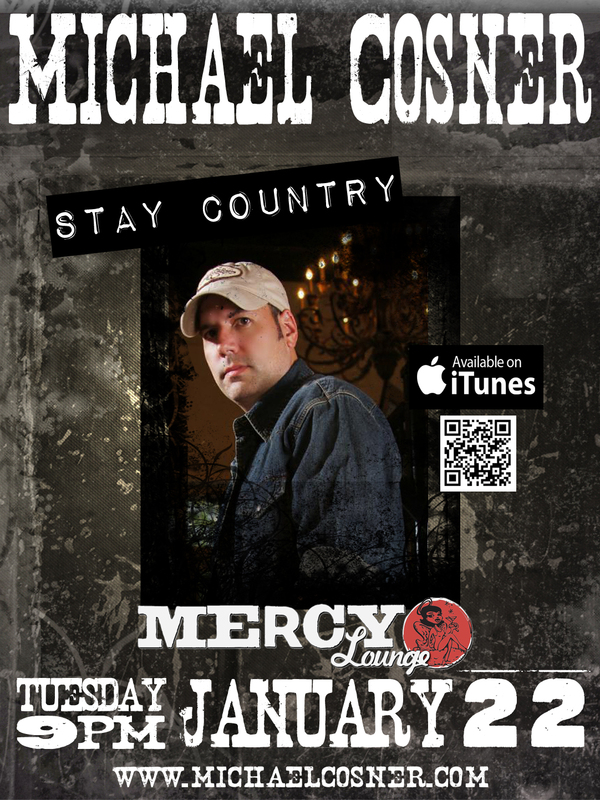 January 14, 2013 -- Hear Michael on this week's Country Dreams Radio Show! Click here for times and stations. January 9, 2013 -- Michael is being featured at Country Music Life. Go check it out! 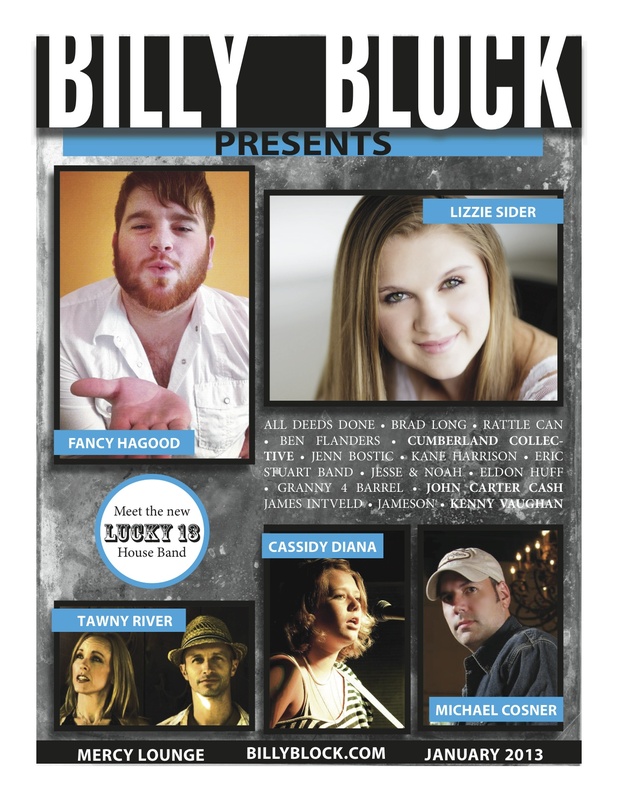 January 1, 2013 -- Michael is on the cover of the January issue of "The Billy Block Magazine." Check it out here. January 1, 2013 -- New show announced! 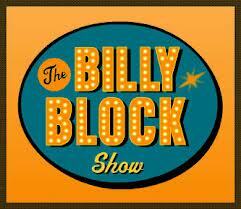 Tuesday January 22, 2013 at The Mercy Lounge in Nashville, TN as part of The Billy Block Show! 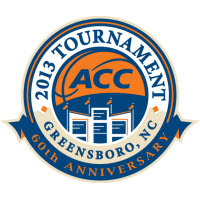 December 31, 2012 -- Michael will be performing as part of the festivities at the 2013 ACC Men's Basketballl Tournament in Greensboro, NC in March! Details TBA. December 13, 2012 -- Michael is now in rotation at Southern Dixie Radio. December 4, 2012 -- New show added! Friday February 15, 2013 at The Don Gibson Theater in Shelby, NC. Show will be headlined by the legendary Gene Watson! November 29, 2012 -- Michael is now in rotation at countryradio.com. October 27, 2012 -- Michael will be taping a segment on 10-29-12 for the radio show "The Right Place with Kevin Sport." Stay tuned for airing date! October 25, 2012 -- Michael will be playing at NASCAR Day in Randleman, NC on Saturday, October 27, 2012. Show starts at 1:30 on the Main Stage. October 7, 2012 -- Michael is now a proud member of the Country Cooperative, as seen on Blue Highways TV. September 4, 2012 -- The new EP, STAY COUNTRY, is available today! Download from iTunes or Amazon.